Description: Bibo Global Opportunity, Inc. is the biggest and the fastest-growing online English school in the Philippines and in Japan. The company produces effective speakers and writers of the English language using fun, innovative, and interactive ways of language learning. Bibo, one of our partners for the TOEIC program, prioritizes applicants with TOEIC scores of 550 or higher. 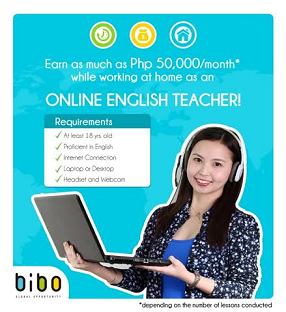 To apply as a Bibo Home-based Online English Teacher, please fill out the application form via bit.ly/ApplyBiboGO. Don’t forget to put your TOEIC score in the “English Certification/s” field.